Now is the time to sign up for a 2018 Season Community Supported Agriculture Share! A C.S.A. is the most simple way to incorporate local food into your life. Subscribing ensures you eat the freshest vegetables in accordance to the season. Your investment in our C.S.A. makes our farm more viable by providing an ensured market. This year we are offering something NEW! A Market Share, which is a pre-paid card you use to buy whatever you wish from our market booths. We continue to offer traditional weekly boxes as well. -Vegetables for 1-2 people, depending on you eating habits. Or Make it bigger - Add $130 for 22 weeks and get an additional $6+ of produce in your box. We offer a payment plan for traditional C.S.A. shares . 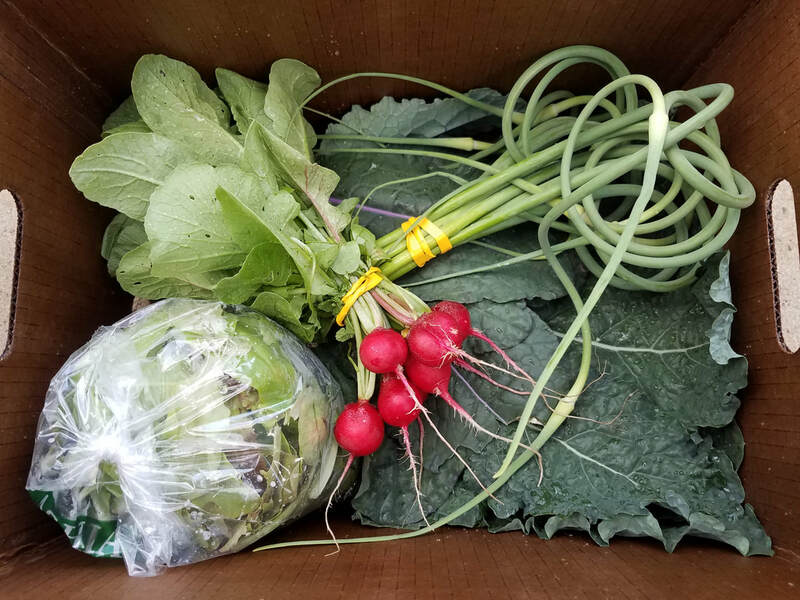 While it is helpful for us to receive CSA payments upfront to get the gears of our farm turning, we also strongly desire to keep our produce accessible. We are happy to accept monthly payments after the initial deposit. You will need to be current on payments to receive each week's box. As new things show up in the box, we provide information, recipes and simple preservation/storage ideas. -Buy a $200+ Chrysalis Earth Farm Veggie Card to spend through the season at either of our market locations in Sylva and Waynesville. -Market share members will get an extra 10% added to their veggie cards. -Veggie Cards can be reloaded through the season in increments of $100 always with an additional 10% added. -Any balance at the end of the calendar year will not transfer to the next season. Traditional box vs. Market share? 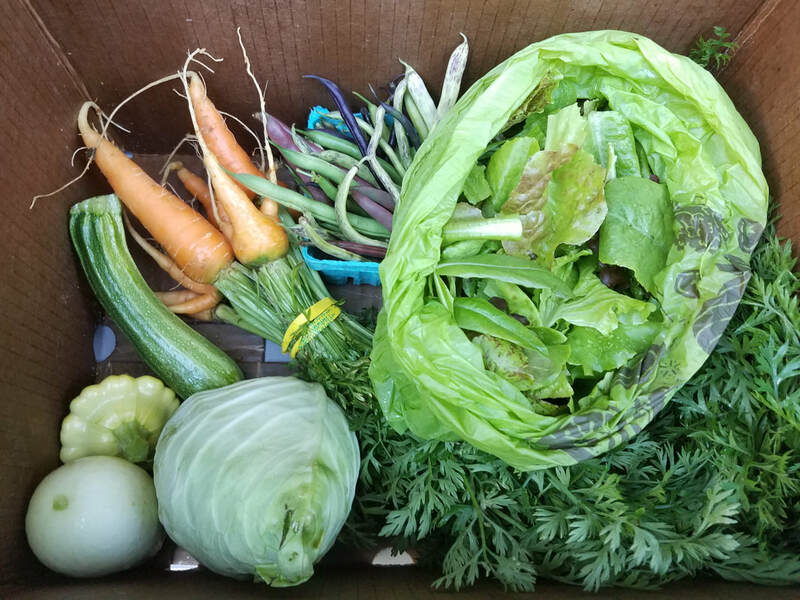 In a Traditional CSA box you will get the most guaranteed variety, as packing boxes is first priority after harvest. If a harvest of a certain crop is small, or just coming in, CSA boxes are likely to get these things. With a traditional box there is little to no choice of its contents. A market share means you have total choice on what to buy. But it also means that market booths have best variety first thing in the morning, so if you come to market late there may be less to choose from. -Wednesdays at our Farm from 4pm-6:30pm. **we may attend the Wednesday market in Sylva and/or Waynesville, if this would be a preferred pick-up for you, let us know as we consider our markets. We specialize in greens. There will always be greens each week, and sometimes several types. 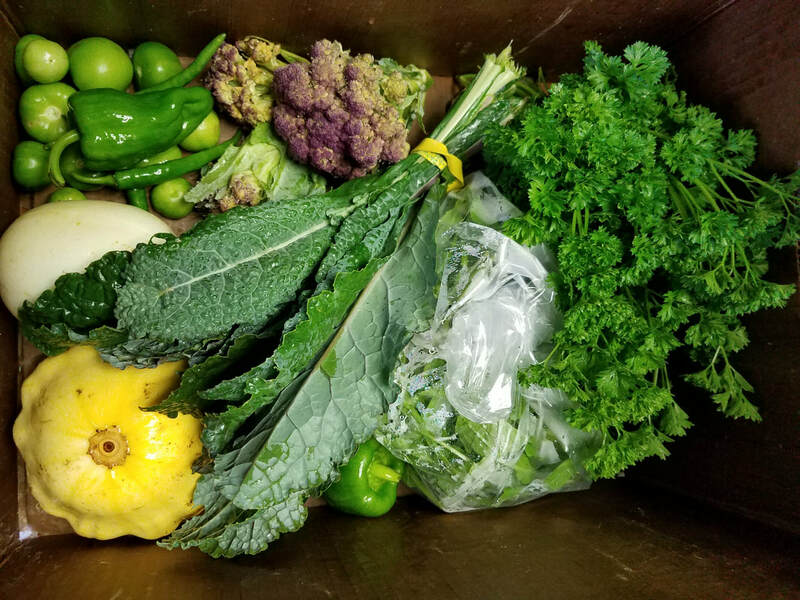 A CSA box will connect you more with eating by the seasons. Through the growing season, there are 4 smaller seasons: spring, early summer, late summer and fall. Each mini season has foods that take the spotlight. Spring comes with cool weather crops that are quick grow and harvest: greens of all sorts (lettuce, arugula, chard, asian greens, kale), radishes, green onion, peas, cilantro, parsley. Early summer bring the longer to mature cool weather foods like cabbage and cauliflower, carrots and beets, as well as quick to mature warm weather foods like summer squash, cucumbers, and beans. Late summer brings in long season warm-weather foods like tomatoes, peppers, and eggplant. And fall again brings the cool weather foods mentioned above. Email us and bring cash, check, or major credit card to market. Bring paper sign-up form and payment to market. Email us and mail us a check. Thank you for considering our CSA. We truly delight in raising this food for you. Please write chrysalisearthfarm@gmail.com for any questions or to sign up.